While adding the new data table (SETIData) to the database I realized that I now had to have a way to add falsification notes to the Hits as they were encountered. This started a chain of events as it usually does. I decided that I needed an editor that would be part of the station software (part of the Control Panel as shown in Operation). I wanted it to be able to generate HTML directly. The best HTML editor that could be built into a Delphi application, like the Control Panel, would only compile under Delphi XE2. I was using XE. I decided to update my compiler. I had to move AsynchPro (used by the Receiver Control code) to XE2. This involved finding a suitable build for it and installing it. I had to recompile the database with XE2. This involved upgrading to XE2 hot patch 1 since the MySQL module I use from DevArt requires it. I found that the File Manager would not compile because its data bindings were pointing to an old version of the SML. I decided that I had to rework the SML from 2011. Thats were I am now. Will I ever be able to back out of this? Its not a sure thing. I managed to recompile the File Manger with XE2. I changed the schema to be 'Station.XSD' rather than 'Hit.XSD'. I managed to get all the database interactions sorted out and then found that I was missing many target.php files in the web site. Each target in the database has a directory, named after itself, and a target.php file within it. There are about 350 of these. To use - build a TXT file from the target database and save it at C:\ Then run the App against it. After several house of find and fix all the missing links are repaired. I found that the remote server I use for the web site times out after being connected to by my station client ( part of the Control Panel). The way the Control Panel works is that it connects to the database and then waits for a hit to come in before it generates a call to the MySQL server on the web site. Since it can take many minutes to hours before a hit comes in the sever was timing me out. A call to my ISP reveled that they can't increase the time out since I am on a shared server. I built a simple Ping generator so that every second while the station is running a 'keep alive' ping is sent to the MySQL server. Works great. I decided to add a fifth state to the SETI Search State Machine (below). Collect Hit will be the place that starts a 'watcher' application that moves the files to the remote server as they are generated, saves each WAV and JPG to local file directory and updates the new database table 'SETIData' with pointers to the files. I tried the new state (Collect Hit) but found it confusing so I added the logic to the Alarm state. This will be a WIP for a while. I have worked out some remote database connect problems but I'm sure more remain. The Head End Electronics have failed. I get no signal from the LNA. Troubleshooting shows that the transfer switch is not working and has to be replaced. The switch is the square silver box on the left. It is shown connected to my HP power meter on the right. The black box behind is the Band Pass Filter. I'm testing a pair of SPST switches now. They seem to work fine. Now the problem is the small line amplifier that I was using. It seems to work fine but draws 200 mAmp. That's just way to high. I opened it up but can't tell much from it and I have no schematic. Anyone have any details on a Dexcel DXA 3103-01 amp? I think I'll go scrounge around for a different line amp. I bought a surplus line amplifier (Amplica Inc. XM381501) from the last remaining store for this sort of thing in the San Diego area (Murphey's in El Cajon). It was a small bet ($10) but it failed as well. I then bought two Mini-circuit amplifiers(ZKL-2R5) from eBay but they are in Israel and will take a while to get here (how is it that Israel has so much good electronics stuff nowadays?). To continue testing I bypassed the line amplifier altogether. It appears that the problem is not in the Head End Electronics at all but in the hard line co-ax leading from the antenna down to the shack. Lucky I have a brand new 50 foot coil of Andrew Telecommunications (now CommScope) F1A-PNMNM Surflex HELIAX that might be just long enough. It is already terminated with type 'N' connectors on both ends and ready to go. I don't remember where or when I picked this up but it will make a great difference. That fixed it. The above picture is of the Spectrum Analyzer as the antenna is pointed to G18 when it was at 35 degrees Elevation and 63 degrees Azimuth. The receiver is tuned to 1575.46 MHz. I have decided on this strategy for collection and presentation of data collected by SETI Net during the search. As data (WAVs and JPGs) are collected and tagged with SML they will be saved into a folder under the web site. On my local host this is "C:\wamp\public_html\archive\data". As each WAV/JPG set is collected its file names will be stored into the database table 'data'. The station will update that table during the processing of a Hit. If the remote host database is in use a Folder Minder application will be used to move the new JPGs and WAVs to the remote server \archive\data directory. Once started the Minder will remain inactive until it senses a change in the local data directory. It will then sync the local and remove folders. This Minder will be constructed using the Automatic File Transfer functions built into a WinSCP client. The database layout works well up till now but it has always bothered me that the final product of the SETI station, the tagged WAVs and JPGs were not integrated into the software. The way it works now is that when a hit is detected and recording starts the JPGs and WAVs are saved onto a folder on the hard disk and that's the end of it. They are identified by there file name which encodes the date and time (2009-01-19T20-46-38.wav for example) but always seemed like close but no cigar. I am re-working the database layout so that the station can automatically save the WAVs and JPGs in a folder in the server and post pointers to the files in a new table of the database. I have to recompile the SETI search software to account for the changes I made in the database along the way but got myself into a mess. I had several versions of Delphi installed and some of the packages would no longer compile. The more I worked on it the worse it became. Finally I overfilled my solid state hard drive which was the icing on the cake. Now I am removing all the Delphi installations and starting over. Until I can recompile the station will be off the air. This afternoon I managed to get a good compile of the entire station. This is no small matter as all 63,000 odd lines of code have to be correct and in the right place for the compiler and linker to like them. Now I can start working on the problem of adapting the database side of the station to the changes I made in the database layout. I started this web site back in 1998 using Microsoft's FrontPage authoring tool. This severed me will until things on the web changed, as they often do. FrontPage requires that the server work with a set of extensions that were no longer supported by Microsoft so that made it difficult. The World Wide Web also switched to being dependent on Cascading Style Sheets (CSS) and I didn't have any knowledge of them. I also wanted to make the web site more data driven where my SETI station would aromatically update what the web site visitor could see in real time. Lastly I wanted to add a new dimension to the web site. I have always admired space and fantasy art being produced for use on science fiction books and movies. 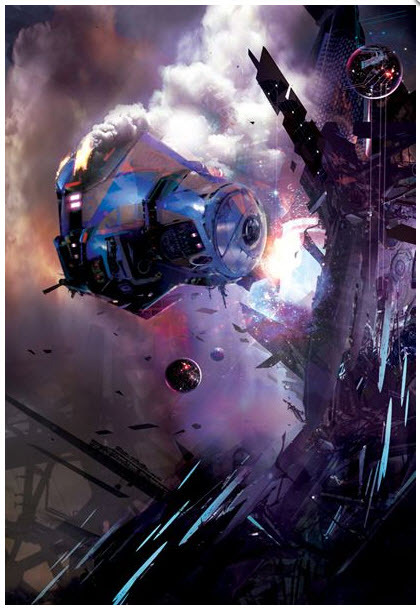 I managed to reach an agreement with Stephan Martiniere, who I consider a premier creator of this type of art to share some of his art with my web site viewers. I combined the new web site structure, Stephan's art and a very nice web template from ProjectSeven called Affinity to set the overall look of the site. I hope you enjoy seeing the result as much as I do creating it.